Reid: You. You look important. Reid: If there’s such a thing as an operating room in this hospital, I need one now. Along with your top neuro team, a Midas, B1 foot plate, and an IGS system, which I pray to God is not considered an antique. Bob: Who are you? What are you doing in my hospital? Just saw that Eric and Van were #1 and #2 respectively on this week’s Soap Opera Source Pulse poll with Luke and Reid finishing #2 (to CarBo – Bo and Carly on DOOL). This is about as close to a trifecta as possible. It’s nice to have a little recognition of the yeoman work these two are doing amidst an otherwise grim week. Congrats to Van and Eric! It was incredibly well deserved and long overdue. More to come later tonight, but I wanted to get the Michael Fairman podcast info up for those who are interested…. HUGE thanks to Michael Fairman, who has continued to be a big supporter of the Doctors without Borders campaign, with back-to-back posts on Tragic Tuesday and again today (Weepy Wednesday?). Among other things, he gives another shout to the campaign in today’s podcast (23:20 through 25:33, News & Views)* and mentions it’s the first time in 20 years in the industry he’s every heard about fans doing anything like this, and the other soap/celebrity interviewers all seem to be aware of the campaign. Listen here. Speaking of which, the DWB campaign hit its initial goal of $15,000 in the hours immediately following Reid’s death, and just before midnight on Tuesday, September 7th. Terri Colombino Interview – Our podcast soap star call-in guest, Oakdale favorite Terri Colombino, discusses Katie’s final storyline on As the World Turns as the show heads towards its final week. Find out her thoughts on the Reid Oliver/Chris Hughes heart transplant storyline and the way it played out, the loss of Helen Wagner, and saying goodbye to the fans who have been so loyal to the 54-year-old soap. Intro/Small talk with Terri begins after the break at about 12:20 and the actual discussions of the endgame begin at 13:40 or so. The endgame discussion ends at 17.35. Terri’s section of the podcast ends at 22.01. If you are ticked off at the ending and/or the interviews/comments from CG/VH/ESS, then this interview will not make you feel better. UPDATE, 9 Sep: After reading others’ posts on ESS, LRO and in live chat, I sense I’m clearly in the minority on this – people don’t seem to be bothered by Terri’s comments at all. So, I guess, listen away and make your own call. Keep in mind that this interview was clearly taped before the 9/3 episode aired (Reid leaves for Bay City), and possibly even before the episodes week of 8/30, so many of us were still holding our breath and following the journey, hoping it would indeed prove to be worthwhile. In the intro, the male host, who I think is Michael Fairman himself, says: “It is just gutwrenching to watch what’s going on. The fanbases are in an uproar because the fans of Reid and Luke feel that they won’t get a happy ending and it’s the gay couple that doesn’t get a happy ending but Katie gets a happy ending with Chris. How do you feel about that? Have you heard any of that? After this promising intro, we get…. Small talk: I hadn’t heard that…..No it’s okay, I get it. I’m a huge fan of that couple as well. When I first heard that, I was shocked, which is a great thing because I was really hoping that they would pull out all the stop at the end because up to a week ago it was all so ho hum. Then we all found out that was going to happen – (we thought) it’s going to be a crazy couple of weeks. But then….It was kind of funny. what he gets hit by a train? That’s weird? (incredulously) Who gets hit by a train?…Unfortunately, I just found that so funny…. Terri finishes this section with: I don’t even know if they’re gonna show anything because how are they gonna get that shot? Terri modestly expresses her appreciation for the praise and has the good sense to include in her comments: Obviously some are more successful than others. As an aside, I subscribe to elle1406’s YouTube channel – she’s like Katie’s HappyInChintz72. As the time this paragraph is being written (Wed 9/8 11.47pm GMT/6.47pm EDT, so approx. 27 hours after Tragic Tuesday ended), her clips of yesterday have a grand total of 2 (yes, that’s two) comments – and they’re both about Luke and Reid. In contrast, ADL has a whopping 596 not to mention BombayHighway (32), smuchshypush (30). Yeah, I’d say that’s less successful. Way to pick the right couple, TPTB. Misc. small talk follows and Terri says about watching the finale with the cast (and crew?) at a sports bar or something: We’re all gonna get together – I don’t know where we’re meeting. It’s gonna be really emotional…. The male interviewer (again, Michael Fairman, I think) then asks, what would you say to the fans? Terri’s response: As we always say….to the fans who we do it for…who have kept us on the air for 54 years….I hope that you enjoy how it ends and that you’ll still be able to picture all your residents of Oakdale that you love years from now….I REALLY love the way it ends because it just keeps it kind of open for interpretation. It gives little hints of where people are going but it…. (doesn’t nail everything down). And finally, about working with Daniel Cosgrove (Chris Hughes): Like the train thing, we really had a heydey with that and it was suppose dot be – We had all this intensely gutwrenching stuff to work with and we were laughing all the time….To be able to do that and turn out and bring out the tears was not feat…He doesn’t take it too seriously but he’s professional at the same time. Can I just tell you how amazing that is to me? 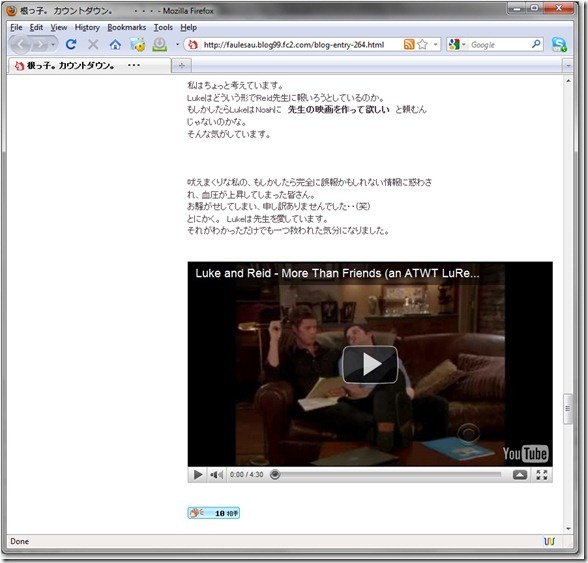 That this storyline is so compelling that my random little fan video has been embedded on a Japanese language blog? And let me tell you – I can’t read a word of katakana, but I can manage a bit of kanji – and one of the words I recognized elsewhere in the blog was “cry.” So yeah, our feelings about Luke and Reid: universal. In any language. This entry was posted on Wednesday, September 8th, 2010 at 5:17 pm	and is filed under News/Updates. You can follow any responses to this entry through the RSS 2.0 feed. You can skip to the end and leave a response. Pinging is currently not allowed. Hi!! Nice to see you!! I’m japanease. I always check this japanease blog. All of japanease lure’s fans are so so sad and we’ve cryed day and night since last week. Although we can’t understand English correctly, we can understand Van and Eric’s acting are amaizing! Well, I want to let you know about us. Yes!! Lure’s fans are all over the world!! 01 Jul 2012 - Van and Eric are still Hot…but we knew that, didn’t we?